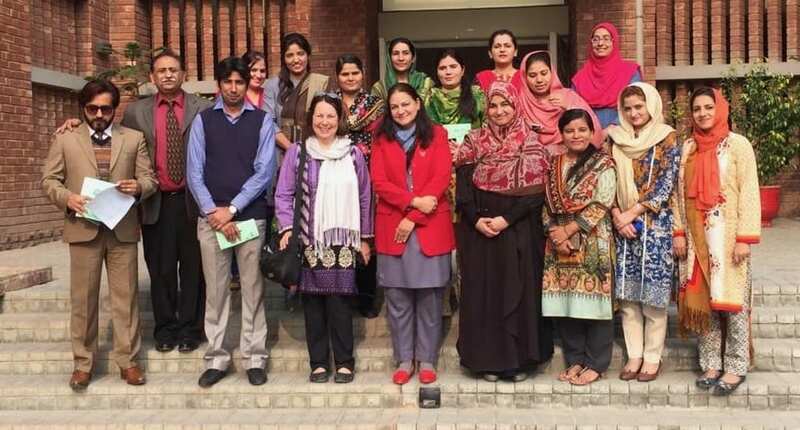 LTS faculty member Trish Pashby spent the winter holidays conducting English teacher training workshops in Lahore, Pakistan. Tell us about your trip to Pakistan. What exactly were you doing there? 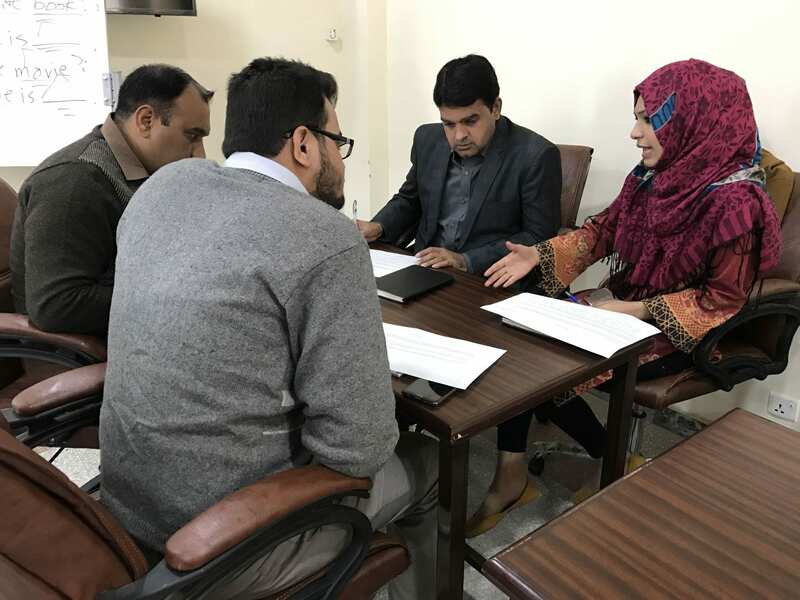 I received a grant from the American Institute of Pakistan Studies (AIPS) http://www.pakistanstudies-aips.org/ to present a series of workshops for faculty at a university in Pakistan over a period of three weeks. 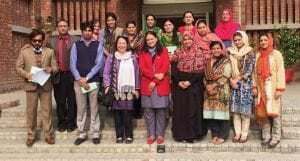 They sent me to University of Education (UE) http://ue.edu.pk/ in Lahore to work with the English Department at their Township campus, which turned out to be fantastic. The administrators and faculty there were incredibly kind and really fun. They gave me an office, made sure I had everything I needed, and fed me delicious lunches every day. I met with some faculty one-on-one to discuss their professional development ideas and classroom practices—which were all very interesting and impressive. The workshops were attended by faculty (and some students) from Township campus as well as instructors from other UE campuses in Lahore and as far away as Vehari and Multan. Sessions included “Professional Development for Very Busy Instructors” “Multimodal Learning” and “Creating Balanced Lessons” and were designed to be as interactive as possible. The participants were lively, experienced, and full of great ideas. I loved the way they were willing to engage in all kinds of activities and admired their dedication to their students and academic careers. I learned a tremendous amount from all of them. While I was there, the university hosted their International Conference on English Literature, Linguistics and Teaching (ICELLT 2018), which featured speakers from all over Pakistan and the world. It was a very exciting three days of amazing sessions and plenty of socializing. I was happy to give a keynote talk (“Revisiting Motivation in Language Learning”), attend dozens of presentations, and get to know attendees during the tea breaks, lunches and the lovely “Culture Night” event, where a number of UE English teachers stepped up to the microphone to sing beautiful songs from their provinces. AIPS also sent me on a quick trip to Islamabad to participate in the International Student Conference and Expo at a session titled “Student-Centric Learning.” What a treat to meet this group of students from universities all over Pakistan and hear about their classroom experiences and preferences. You were in Pakistan before, right? 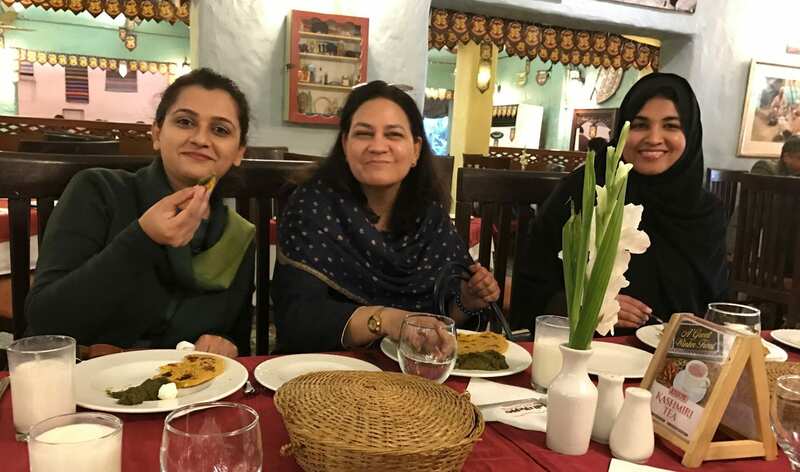 Yes, I traveled to Pakistan three times before as part of a U.S. State Department partnership grant University of Oregon had with Karakoram International University up in Gilgit, all really wonderful adventures. 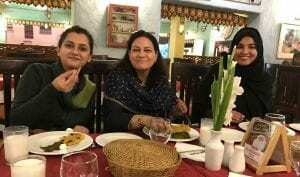 But this was my first trip to Lahore, which was very different from the cities of Islamabad and Gilgit. 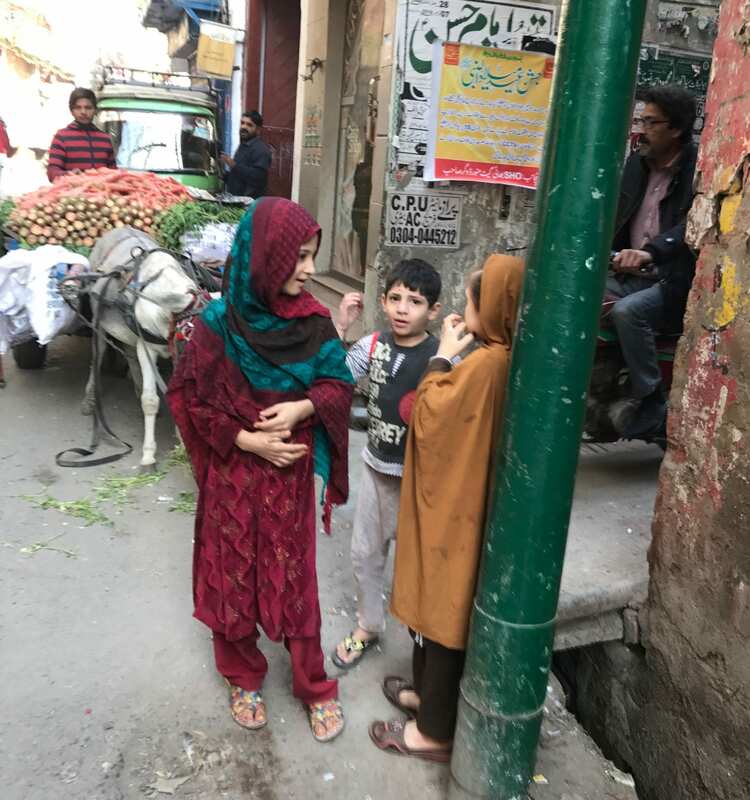 Lahore was bursting at the seams with energy: The streets were packed with cars, motorcycles, donkeys (pulling carts), pedestrians. The city has a great vibe, friendly people, and fabulous food. 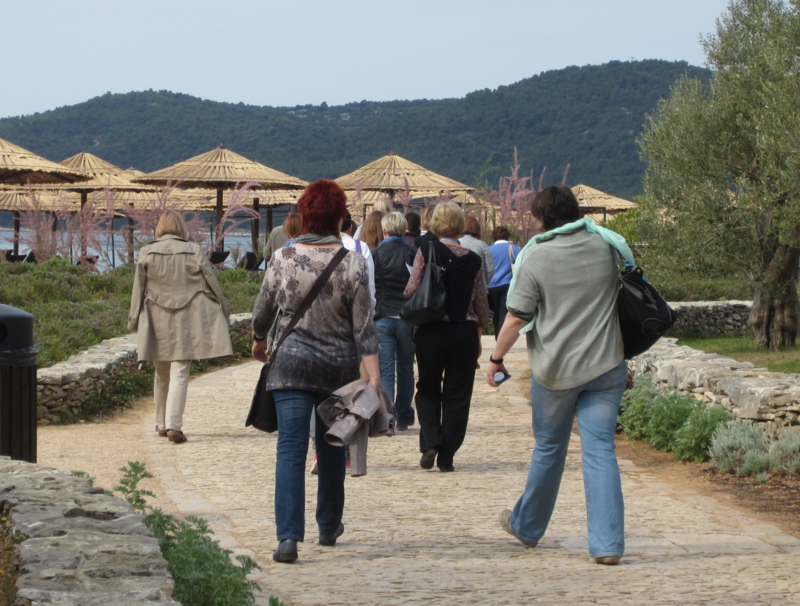 Were you able to do much sightseeing on this trip? Some! 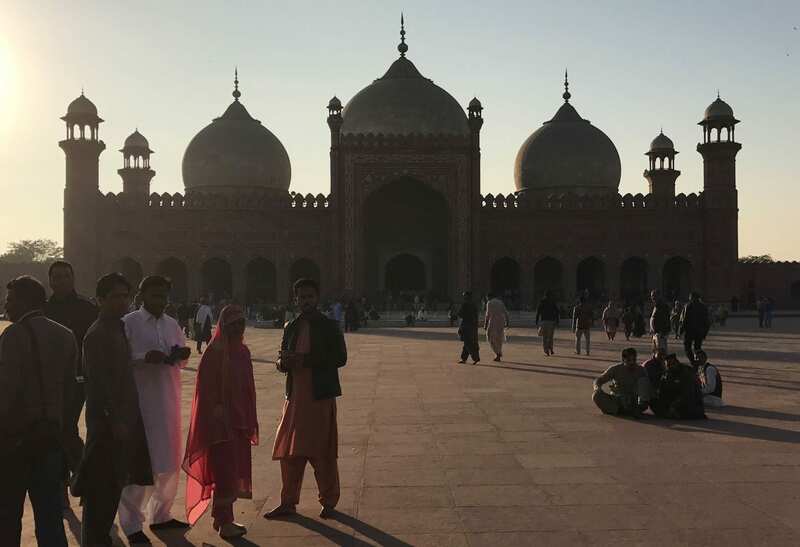 I spent a magical Sunday wandering through the Walled City (eating a traditional brunch at the fantastic Faqir Museum hosted by the owner, searching music shops for small instrument to use in my workshops), visited the incredible Badshahi Mosque, and then strolled around the historic Lahore Fort at sunset. I also took a lovely walk in Shalimar Gardens one afternoon and went to a really fun Rahat Fateh Ali Khan concert. Otherwise, I enjoyed exploring the little neighborhood where I stayed, with its parks and shops. 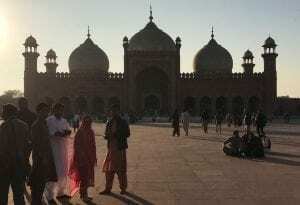 I feel I’ve just started to get to know Lahore and will definitely have to return. LTS faculty often travel internationally as part of their work, since language teaching and learning is often very connected to international interactions. 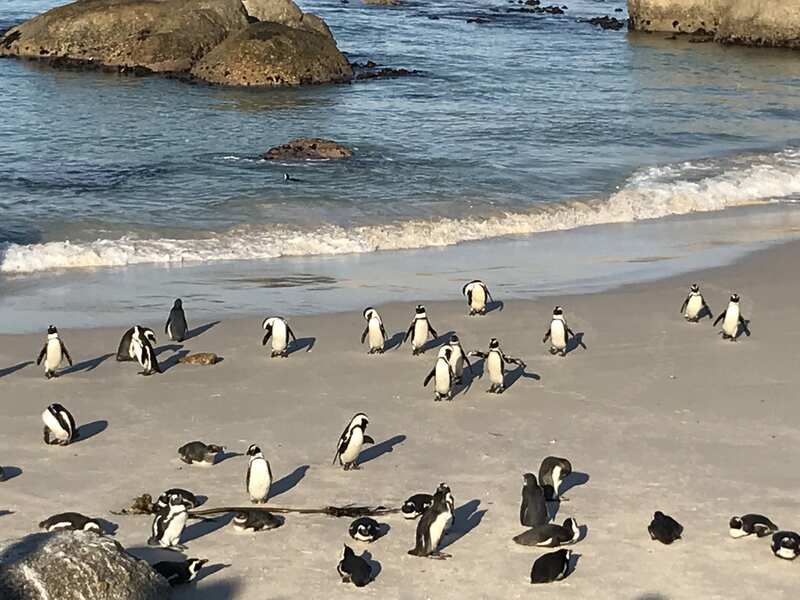 This week’s blog feature’s LTS Director Keli Yerian’s unusually far-reaching travel this past week in early July – to the southern tip of Africa in Capetown. Why were you visiting Capetown? My research interests are in language and gesture, particularly in how language teachers learn to use their bodies as an integral part of language teaching when the learning context is face-to-face. There is an association called the International Society for Gesture Studies that holds a conference every two years, and this year it was held in South Africa. 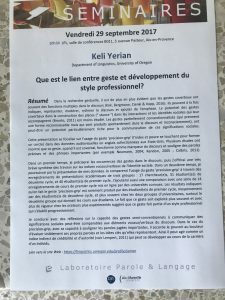 Did you present at the conference? This time I presented with my colleague from France, Marion Tellier, which whom I am co-authoring some comparative research studies with data from our program in LTS, and the MA teacher education program she directs in France. We are noticing some similar patterns of gesture development in both programs, as well as some contrasts that may be related to differing educational and cultural contexts. We are both very interested in how typical co-speech gesture becomes more stylized and conventionalized in specific ways when used in pedagogical situations for depicting content and for serving pragmatic purposes in interaction. Unfortunately we forgot to ask someone to take a photo of us presenting, so I can’t show one here! Sitting at the top of Lion’s Head – what a climb! 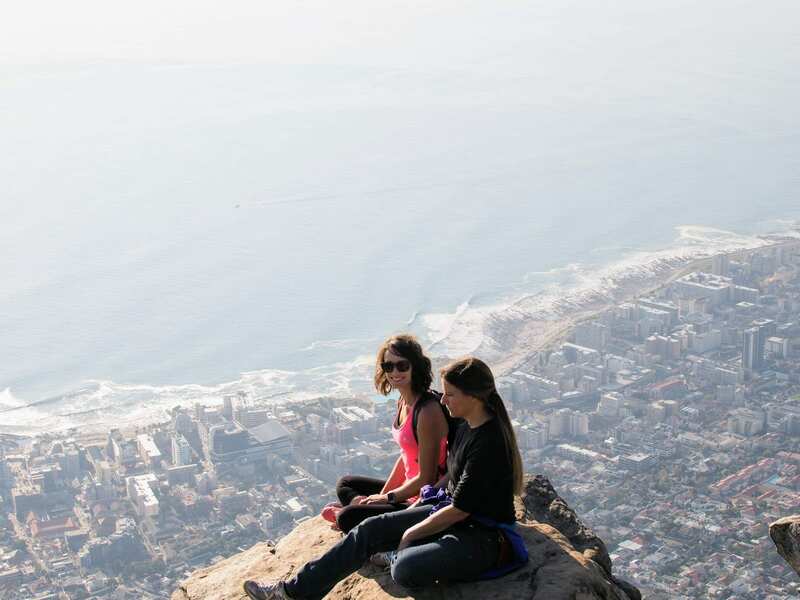 Did you do anything else in Capetown? For most of the conference, we were always in the same conference hotel. Breakfasts and lunches were all provided there. Unfortunately, exploring around the city after dark was not safe in the heart of the city, so we only went out to dinner in groups to nearby places. 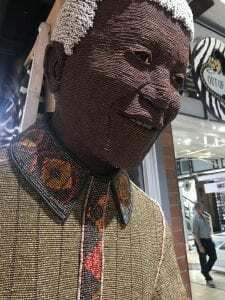 The legacy of apartheid was very apparent all around us, and safety issues were just one aspect of this. It was only about 25 years ago that explicit discrimination was ended in South Africa (people of color were denied equal rights in most imaginable ways), and one generation is not enough to change the effects of racism and unequal access to resources and opportunities. We were lucky to meet a few South Africans who talked to us quite frankly about this legacy, which we appreciated. We did spend the last days combining work with fun trips. 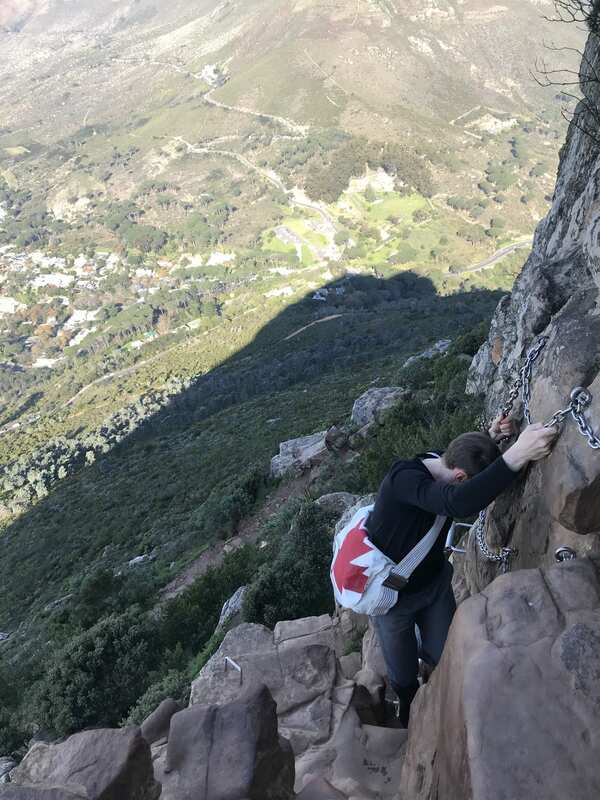 Some of us hiked to the top of Lion’s Head, which involved literally climbing up ladders built into the cliffs and pulling yourself up chains, and we visited an animal reserve where we saw lions, cheetahs, giraffes, and elephants. We also went to the very end of the cape – the tip of the continent of Africa – that was impressive! Finally, we visited the famous botanical gardens. 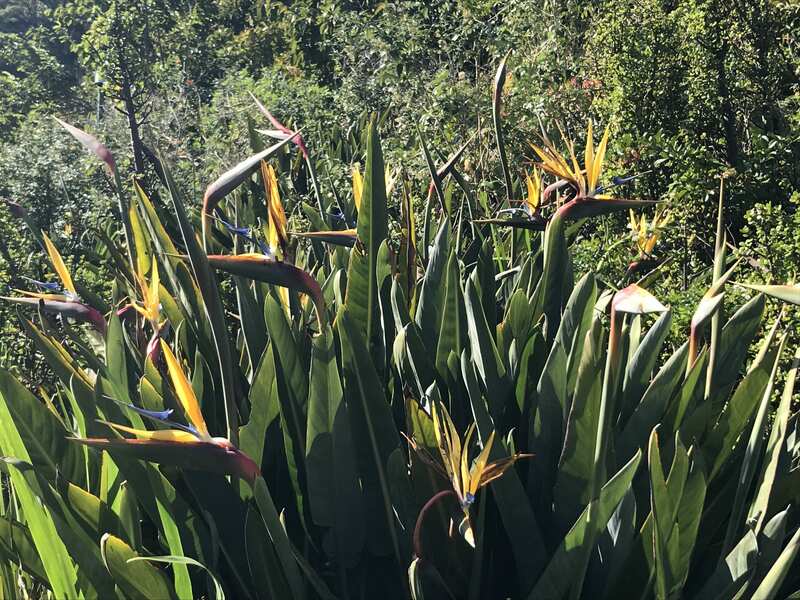 The birds of paradise flowers looked like a flock of cranes peering out of the bushes. It was the middle of winter there, so the weather was cool. Luckily the country had recently had some good rain; there was a water crisis before we arrived that was better by the time we were there, but we still took 30 second showers and didn’t let faucets run. It made me really appreciate the delicious water here in Eugene. Did I mention the penguins? 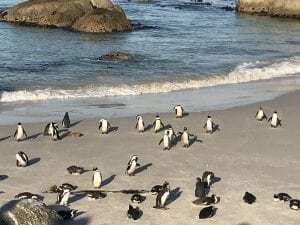 Yes, penguins in Africa. I doubt I’ll ever return there, but if any of you get the chance, I recommend it! From Keli: As all LTS students this year know, I am on sabbatical for 7 months Fall and Winter terms. I am spending Fall in Aix en Provence, France, and Winter back in Eugene. 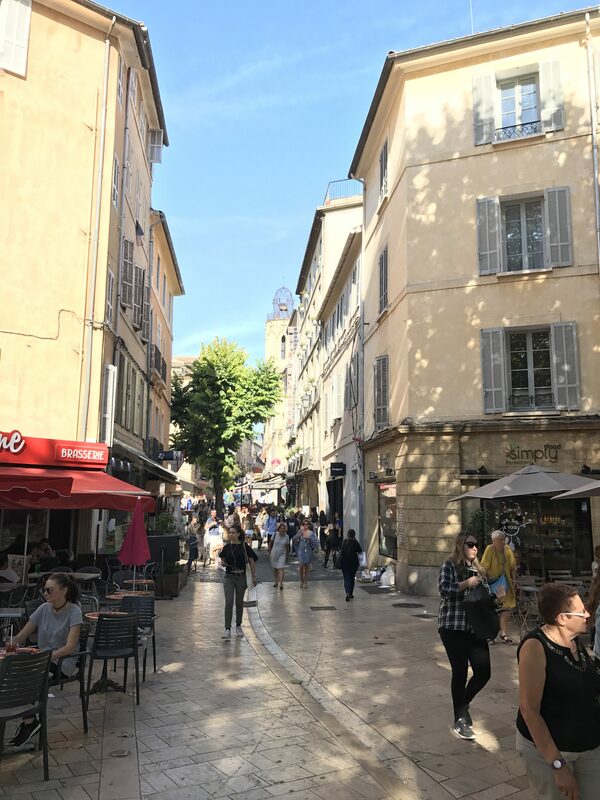 One of the streets I often walk down in Aix. After seven years of being LTS Director year-round, I must admit I am happy to get a breather from administration to focus on research and writing (not to mention the wine and food). I’m also happy to be in the L2 (second language speaker) seat again. It’s important for language teachers and teacher educators to remember what it is like to live in a second language; it’s exciting but definitely frustrating and discouraging at times. It’s all part of the language learning cycle. 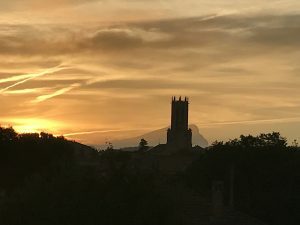 The view out my window of the famous cathedral St. Sauveur and behind it, the St. Victoire mountain, painted often by Cézanne. 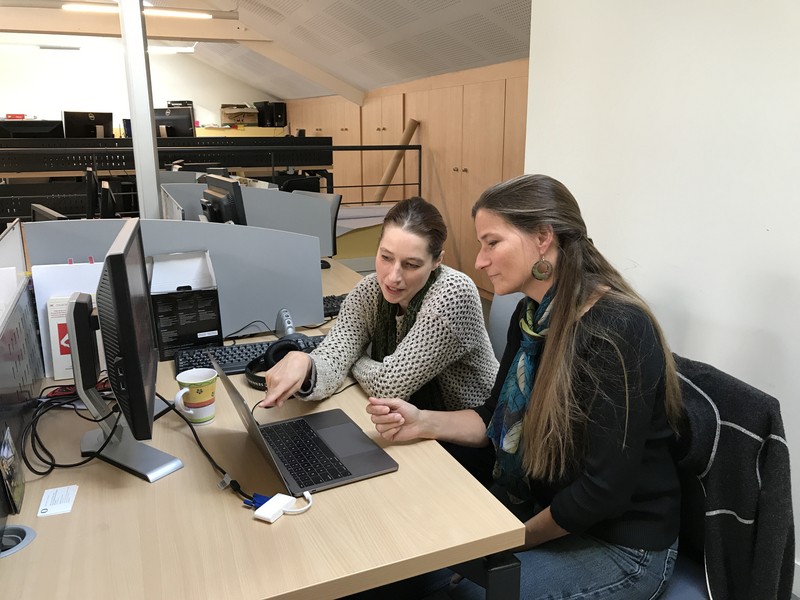 has welcomed me to the University of Aix-Marseille/Laboratoire Parole et Langage as a visiting scholar to look at data together and start a collaborative project. Both of us are interested in gesture and language pedagogy, specifically in how to think about the use of gesture and the body in language teacher education. She is in fact the co-author of an edited book on the topic already (the only such book I know of). She also co-directs and teaches in the MA program in teaching French as a Foreign/Second Language at the university, so we have many experiences in common. To get a project started with Marion using our similar data from our respective programs. We are presenting a poster at a local professional gathering later this month, and planning to collect more teaching data in her program over the next few months. To make significant progress on writing up another gesture manuscript (which I’ll be presenting this month at a colloquium at LPL). To work towards professional-level fluency in French. I am getting plenty of practice towards this! My biggest challenge here is that I miss my family. I will not see them in person for three months. But the end of the year will arrive soon, I know. Have a wonderful Fall and Winter terms, LTS! You are in excellent hands with Trish Pashby as Acting Director. 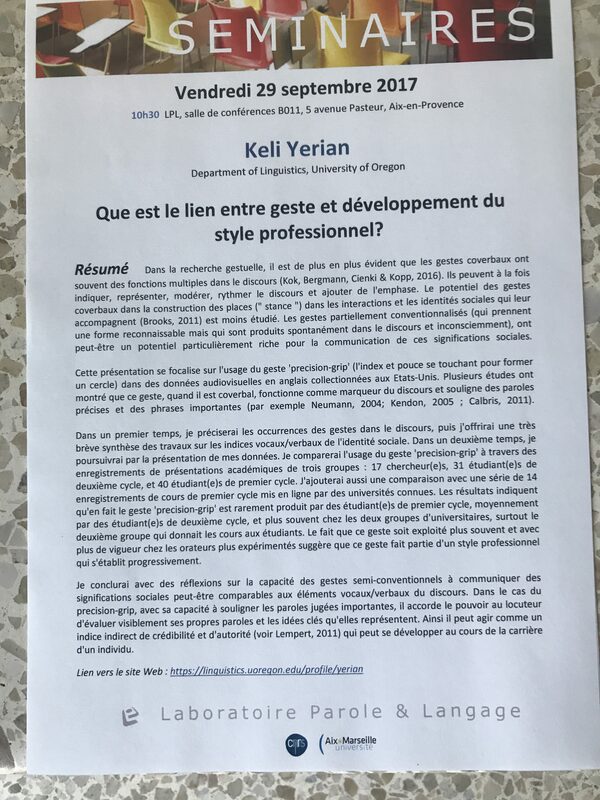 From Trish: I am thrilled for Keli that she is able to take advantage of this exciting professional opportunity in France and am also excited that I get a chance to serve again as director of the LTS program while Keli is away. I was director of the program once before (2007-2010) and since then have been teaching at least two courses per year in the program and participating as an MA project advisor, among other faculty duties. I look forward to additional contact with current students (teaching the orientation course; meeting to discussing course schedules, internships and other opportunities; facilitating various stages of MA projects) as well as interacting with future ones. This term, I will have open office hours in Straub 167 every Monday, Wednesday and Thursday from 12:00-2:00 and will be available other days/times by appointment. 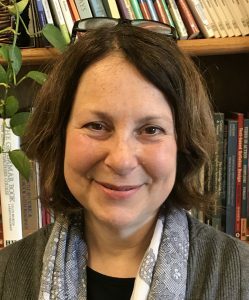 Trish Pashby is a Senior Instructor II in the American English Institute and has been a teacher educator in LTS since the program began in 2004. 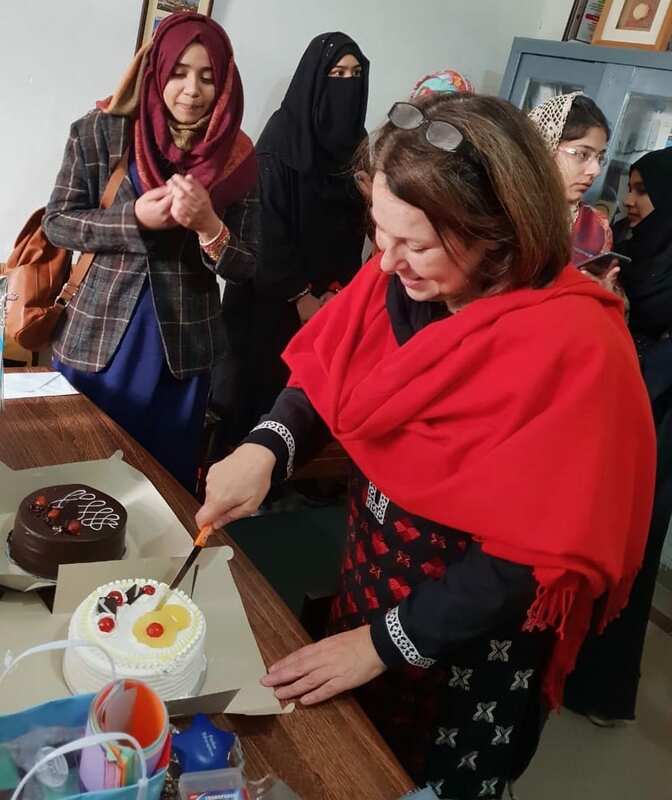 She has taught many of the LTS courses over this time, and currently teaches her favorites, LT 541 Teaching Pronunciation and LT 528 Teaching Culture and Literature. checking in with them about their progress and providing encouragement and guidance to keep going. Sadly, only a handful of my colleagues share this passion. In fact, many English language teachers lack confidence in how to teach it at all (Baker, 2014; Murphy, 2014). This may be partly explained by the fact that “relatively few teacher education programs provide courses on how to teach L2 pronunciation” (Baker, 2014), which experts in the field (Derwing, 2010; Murphy, 2014) deem essential. The LTS program requires LT 541 (Teaching English Pronunciation) for students focusing on English. In this post, I will share some of the key areas we cover in the course. If you are a current or future language instructor who feels nervous about teaching pronunciation, I strongly encourage you to dabble and play with the following. Parts may lead to ways for you to build your confidence, and maybe even fall in love. Munro and Derwing (1999) define intelligibility as how much a listener actually understands, comprehensibility as how difficult it is for the listener to understand, and accent as how the speech varies from the dialect of the listener. For example, substituting a “th” with /s/ in “think” or /d/ in “the” will probably fall under “accent” if the listener notices the substitution but has no trouble understanding. In diagnosing the pronunciation of their learners, teachers need to distinguish among the three, and prioritize the former. Several key questions interact with this to create the “big picture.” What are the learners’ goals? Who will they be interacting with? What is possible? Reasonable? Desirable? (Don’t assume all of your learners want to acquire your particular pronunciation. Some may prefer another dialect of English. Or want to maintain a connection to their native language.) What about those seeking to sound native-like? What progress can they make and what role can you play in that? Can non-native speakers be good pronunciation teachers? My answer to this last question: Yes, of course non-native speakers can be excellent pronunciation teachers as long as they understand the sound system of the target language and have the skills to communicate this to learners through effective practice activities. They can use their own voice to model the language but should also present a variety of models to their students, just as native speaker teachers should. Advice: Keep your assumptions to a minimum and instead rely on (1) much communication with your learners and (2) current research in the field. For many teachers, especially those who are native speakers of English, suprasegmentals may present the most challenging aspect of pronunciation teaching and require considerable training of the ear. I clearly remember sitting in a phonology class years ago as a student unable to distinguish one syllable from another—to my ear, none sounded longer, clearer, higher. However, suprasegmentals can play a huge role in the intelligibility and comprehensibility of your learners and will thus need your attention. Rising vs falling intonation might be a reasonable place to begin—for example, exploring American English patterns for differentiating wh-questions from yes/no questions. I tend to start off my pronunciation courses with a lesson on “tonic stress” (the main stress in a thought group), which is essential for the international graduate students and scholars I work with. This is then followed with a session on word stress, also key to their intelligibility and comprehensibility. Rhythm (stressing content words and reducing function words) is covered in many pronunciation texts for students, yet not all experts agree on how accurate/effective this is. Dickerson (2014) argues this approach should be replaced with finding the “anchor” among the content words to complement the tonic stress. To consider: How does intonation affect meaning in English? Where does tonic stress usually occur? Why might it vary from this position? What are typical word stress patterns in English? Which of these might be most useful for students? Advice: Teach yourself–with patience and kindness–to hear/notice stress, intonation, and rhythm (most of which may lurk below your consciousness, especially if you acquired English as a child) and become familiar with the fascinating role they play in English communication. I recommend getting your hands on one or more pronunciation textbooks for students and carefully studying the exercises. In my case, I finally learned to hear stress via the first edition of Marsha Chan’s (1987) Phrase by Phrase. Set a goal for yourself to learn the phonetic symbols and details of articulation for all the sounds of the target language. You probably won’t be creating lessons for all of them, but you’ll want to be ready in case a student needs some feedback or instruction. If IPA symbols intimidate you, look into alternative systems such as “the color vowel chart,” which provides a very accessible way to for teachers and students to understand and manage North American English vowels: https://elts.solutions/color-vowel-chart/. To consider: Which sounds most strongly affect intelligibility and comprehensibility? How do sounds change depending on their place in a word and the sounds surrounding them? What is the best way to convey this information to learners? What kind of practice is most effective? Advice: If mastering all of the vowels and consonants feels overwhelming, pace yourself and start with a few at a time. Consider which sounds are most connected to your learners’ intelligibility and comprehensibility issues. You can also explore information on “functional load”: the frequency of a sound’s occurrence and in how many instances this sound distinguishes one word from another. Students will need plenty of production practice, moving from very controlled exercises (with limited focus on meaning to keep the attention on the new sounds) to gradually more meaningful contexts. They will also need strategies to continue building skills outside of the classroom. English classes focusing primarily on pronunciation are rare. Thus teachers must find ways to bring pronunciation instruction into courses that focus on other skills. 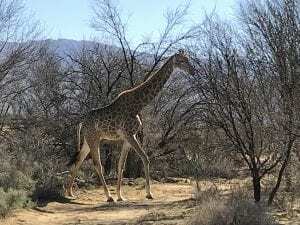 These lessons may be less elaborate than those in a pronunciation course but can certainly cover both segmental and suprasegmental aspects affecting intelligibility and comprehensibility. 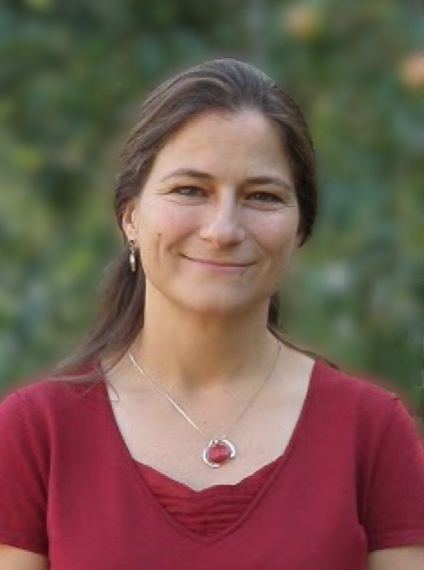 Char Heitman, a guest lecturer in LT 541, presents a variety of such activities to use in a reading/writing course including having students search texts for specific spelling/sound correspondence examples, chart new vocabulary according to word stress patterns, and practice thought groups and intonation before discussing key ideas [http://eflteachingresources.blogspot.com/2015/02/shaping-way-we-teach-english-webinar_15.html]. Additional ways for integrating pronunciation across the curriculum can be found in several chapters of Tamara Jones’ (2016) Pronunciation in the Classroom: The Overlooked Essential. Form a group with colleagues or classmates (or go solo, if you prefer) to tackle areas of pronunciation instruction most important and interesting for your teaching context. Resources might include the following. Jones, T. (2016). Pronunciation in the Classroom: The Overlooked Essential. Alexandria, VA: TESOL Press. Meyers, C. & Holt, S. (1998). Pronunciation for Success. Aspen. Dale, P. (2004). Pronunciation Made Simple. Pearson. Lane, L. (2012). Focus on Pronunciation 3. Pearson. Grant, L. (2016). Well Said. Cengage. Miller, S. (2005) Targeting Pronunciation. Cengage. Journals in the field, such as TESOL Quarterly, regularly publish research related to pronunciation teaching. TESOL’s “Speech, Pronunciation, Listening” interest section publishes a newsletter with practical ideas for teachers [http://www.tesol.org/connect/interest-sections/speech-pronunciation-and-listening/as-we-speak]. Conferences are an especially enjoyable way to build your pronunciation expertise. The annual TESOL conference always features a number of excellent pronunciation workshops and demonstrations, from which I have learned many of my favorite techniques and activities for pronunciation fun. Baker, A. (2014). Exploring teachers’ knowledge of second language pronunciation techniques: Teacher cognitions, observed classroom practices, and student perceptions. TESOL Quarterly, 48, 136–163. Derwing, T. (2010). Utopian goals for pronunciation teaching. In J. Levis & K. LeVelle (Eds. ), Proceedings of the 1st Pronunciation in Second Language Learning and Teaching Conference, Iowa State University, Sept. 2009. (pp. 24-37). Dickerson, W. (2014). A NAIL in the coffin of stress-timed rhythm. Proceedings of the 6th annual pronunciation in second language learning and teaching conference, UC Santa Barbara, Sept. 2014. ( pp 184-196). Munro, M. & Derwing, T. (1999) Foreign Accent, Comprehensibility, and Intelligibility in the Speech of Second Language Learners. Language Learning, Vol. 49, Supplement 1, 285–310. Murphy, J. (2014). Myth 7: Teacher training programs provide adequate preparation in how to teach pronunciation. In L. Grant (ed) Pronunciation Myths: Applying Second Language Research to Classroom Teaching.pp188-224 Ann Arbor, MI: University of Michigan Press. Keli Yerian directs the Language Teaching Specialization program at the University of Oregon. Her research interests are in language and interaction, most specifically in the use of gesture in both L1 and L2 speakers, as well as language teacher education, including the goals and experiences of L2 speakers in language teacher education programs. Peek inside one language classroom. Here we see students using actions and brief responses to show they are following the teacher’s story. Peek inside another. Here we see students repeating after the teacher to show they can accurately (re)produce the target sounds and structures. In the first classroom, the teacher is using comprehension-based instruction, with a focus on helping students acquire language through carefully structured input. In the second classroom, the teacher is using production-based instruction, with a focus on helping students acquire language through repeated spoken practice. What do these classrooms have in common? If these two classrooms always look like this, every day, all year, we might say the common point is that they both tip dangerously to only one side of the spectrum of teacher beliefs and practices regarding instructed language learning. On one end of the spectrum is the belief that language acquisition requires the exclusive ingredient of comprehensible input. Indeed, comprehension-based instruction is strongly supported by some research (e.g. following Van Patten, 2007) that shows that structured input (input that compels learners to focus on form in order to access meaning) can lead to improved proficiency not only in comprehension but in production as well. On the other end of the spectrum is the claim that a skill will only be acquired if it is directly practiced multiple times (see DeKeyser, 2007). While the direct practice claim has been less supported by research, studies do show that language acquisition may remain incomplete without the opportunity to ‘notice the gap’ between one’s own production and the target forms. Importantly, this benefit appears only when production involves meaningful exchanges that allow for the noticing and mediation of forms (e.g. see Swain, 2000). However, it is never a good idea to judge a language classroom from just a moment of peeking in. A good language classroom will reveal, over time, a rich range of coherent practices, and include varied opportunities for learners to process authentic and structured input, meet the challenge of crafting output, and negotiate meaning with peers, texts, the teacher, and the wider community. Maybe, if we peeked into these same classrooms some minutes later, or on another day, we would see something else entirely. A peek into the first may reveal students producing posters to present to their peers, and a peek into the second may show students immersed in extensive reading groups. In this case, our answer to the question above is turned on its head: what both classrooms have in common is the commitment to providing students with a full range of input, interaction, and output – all key ingredients for a ‘balanced meal’ in instructed language learning. DeKeyser, R. (2007). Practice in a Second Language: Perspectives from Applied Linguistics and Cognitive Psychology. New York, Cambridge University Press. Swain M. (2000). The output hypothesis and beyond: mediating acquisition through collaborative learning. In H. Byrnes (ed.) Advanced Language Learning: The Contributions of Halliday and Vygotsky. London: Continuum. Van Patten, B. (2007). Input processing in adult second language acquisition. In B. VanPatten and J. Williams (eds.) Theories in Second Language Acquisition (pp. 115-35). Mahwah, NJ: Lawrence Erlbaum. What are the skills our students need to successfully participate in life and work in the 21st century? How can we, as teachers, help support our students in developing these skills? All teachers today are hopefully asking themselves these essential questions. Beginning in 2002, the Partnership for 21st Century Skills identified communication, collaboration, critical thinking, and creativity as the four key skill areas most necessary for success in the 21st century (P21, 2016). You’re probably familiar with these terms already, but let’s consider each one briefly. Communication of course is the ability to interact with others. Importantly, we have to remember that communication can happen in many ways and across many formats. For example, communication can happen both in body language and spoken interaction, and it can also be face-to-face or digitally mediated in some way. Collaboration means working effectively or productively in groups or teams to accomplish a task or goal. Critical thinking happens when we analyze a problem from diverse perspectives and evaluate different solutions. Finally, creativity involves producing innovate and original ideas in ways that would not be expected. If these are the skill areas valued most by employers and by society in general, then educators of course need to consider how to incorporate these skills into the classroom. When we think about language education in particular, we have to think about the unique challenges faced by students trying to learn to communicate and think critically in a second, third, or even fourth language. Another key for 21st century students is digital literacy. Students in the 21st century need the digital literacy skills to not only find and critically analyze information, but also to create, edit, and publish information of their own. This shift toward a new emphasis on creating and sharing information has been called participatory culture (Jenkins, 2008). Aside from the four Cs, full involvement in a participatory culture also requires skills such as transmedia navigation, social networking, and multitasking. Taken together, we can see a range of digital and new media literacy skills that young people today need to possess. The challenge for language teachers of course is how best to support the development of these skills in the classroom. One easy way to encourage students to make use of 21st century skills is to combine elements of Communicative Language Teaching (CLT) and Project-Based Learning (PBL). Thinking specifically about the four Cs for example, it is not hard to imagine a range of interesting projects that could help students target these skills. And if teachers ask students to produce and share videos as one project outcome, we can also have students working on new media literacies as well. Learning in this way is valuable because classroom language use becomes the means rather than the end. When students are collaboratively working on projects, they are not only gaining valued 21st century skills, but they are also utilizing language for an authentic purpose. P21 (2016). P21 Partnership for 21st Century Learning: The 4 Cs research series. Jenkins, H. (2008). Confronting the challenges of participatory culture: Media education for the 21st century (John D. and Catherine T. MacArthur Foundation Reports on Digital Media and Learning). Chicago, IL: MacArthur Foundation. Click here to see Andy Halvorsen’s LTS blog faculty profile. In today’s post, LTS faculty Deborah Healey discusses the opportunities and benefits of taking the lead in professional organizations in the field. You can read more about Deborah Healey on a past blog post here. 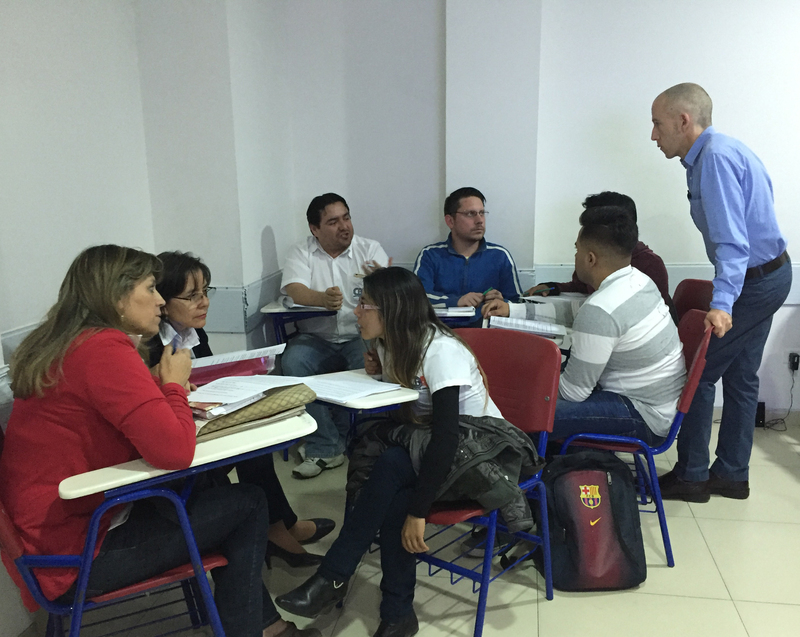 Professional organizations like ORTESOL, ACTFL, and TESOL International Association are successful because they offer a variety of activities, networking, and support for their members. Volunteers with the organization provide the bulk of the support. They guide the organization and its activities. Volunteers are the backbone of annual conventions, for example, and most organization newsletters and websites have content provided by volunteers. These volunteers are both necessary and very visible parts of the organization. 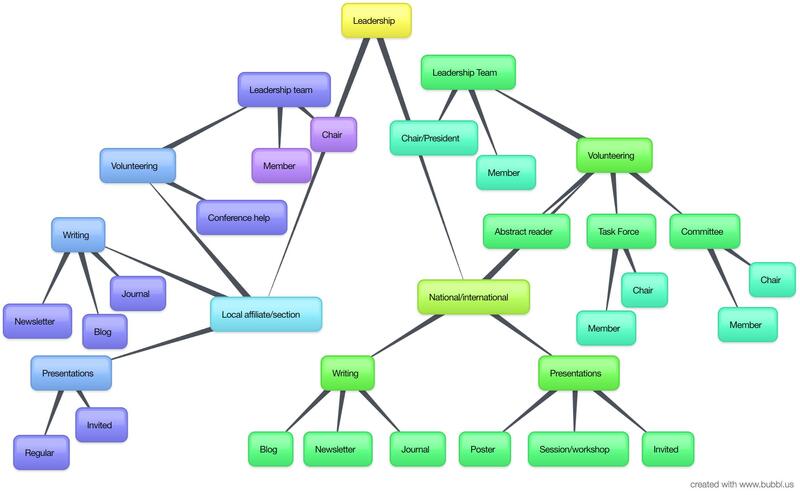 Organization leadership comes from the volunteers who have been active in the organization and the profession. What does this mean for graduate students and other professionals in language teaching? It means that you can give to your profession and add to your resume by volunteering. This will help you move forward on a leadership path. I’ve been part of the leadership of ORTESOL and TESOL at different times and in different ways. I’ve been the ORTESOL Newsletter editor, part of several TESOL Task Forces and a TESOL Interest Section Chair, and a member of the CALL Interest Section Steering Committee. 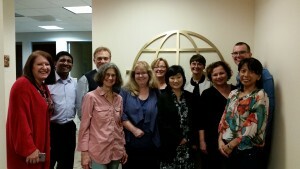 I am now on the Board of Directors of TESOL, making decisions about policy and governance for the association. Being on the Board was not on my mind when I agreed to be ORTESOL Newsletter Editor, nor when I was on different Task Forces and involved in the Interest Section. Like most volunteers, I took part in those activities because they sounded interesting. They gave me great connections and good friends. 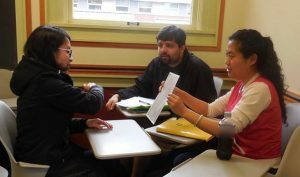 My involvement has made me a better teacher and, overall, a more competent professional in the language teaching field. This involvement has also given me the opportunity to travel to international conferences as an invited speaker. You can start on a path to leadership by doing many of the same things that you may be doing now. Write for your local affiliate/section of a professional organization (the ORTESOL Newsletter Editor would love to hear from you!). Present at a local and national conference (poster sessions are usually easiest to propose and have accepted). Volunteer to help with the local conference if it is nearby or with the national conference if you are planning to attend. People in the organization will notice your work. As you take on more responsibilities – because they seem interesting, of course – you will be on a leadership pathway that may take you to new and exciting places. 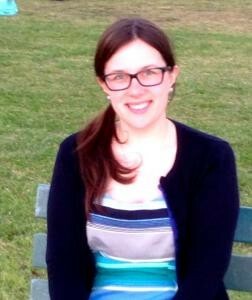 In this LTS blog post, LTS and Linguistics faculty member Melissa Baese-Berk writes about the importance of valuing and integrating multiple varieties of dialects and accents in the language classroom. During our term, we spend a lot of time examining our ideas about “standard language,” and the impact that these ideas have had on our thoughts about language more generally speaking. We begin the term discussing the remarkable structure throughout language, even in unexpected places (e.g., non-standard dialects). We also spend several weeks discussing the substantial variability found at every level of language both within and across speakers. As students begin to examine linguistic facts about structure and variability, they frequently begin to question many of their own beliefs about language. Many of my students are heritage language students who have been exposed to one dialect at home and then learn a different dialect in their language classroom. They’ve received different messages about the prestige of their home and school dialects and languages throughout their lives. When they realize that a many of the judgments about languages and dialects are social, rather than linguistic in origin, students begin to see value and prestige in all the forms of language they use. Language teachers hold remarkable power in helping students form ideas about language, dialects, and accents. The language and dialects students are exposed to in the classroom are held in high prestige because they are the targets for learning. 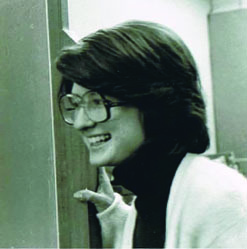 However, when the language varieties used in the classroom are limited to those typically seen as prestigious by the broader community, students may view other varieties as “non-standard.” Students from heritage backgrounds may feel as though their home varieties are being marginalized. Students being exposed to the language for the first time may learn to reinforce the typical societal views about prestige of certain language varieties. If, however, students are exposed to multiple dialects and accents during the course of their learning, they may learn to value all these varieties. 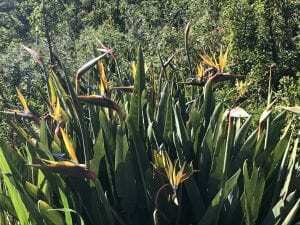 Exposure to these varieties may have the added side effect that students may also able to communicate with more individuals outside of the classroom, rather than only individuals who speak a “standard” or prestige variety. A widely cited broad definition of heritage speakers in the US by Valdés (2001) includes individuals raised in homes where a language other than English is spoken, who are to some degree bilingual in English and the heritage language and, who also have a personal interest or involvement in an ancestral language. Polinsky and Kagan (2007) offer a narrow definition of heritage language as the language which was sequentially first, but may not have been completely acquired due to the speaker’s shift to another language as their dominant means of communication. The latter distinction suggests that, like foreign language learners, heritage speakers may differ in their proficiency levels. Kagan and Dillon (2004) outline the following “matrix” for programs targeting heritage language learners: proper placement; time on task; programmatic rigor; specific instructional materials; an uninterrupted, comprehensive curriculum; instructors trained in heritage language acquisition; a multi-year sequence; consideration of the home/community native speaker environment; and a metalinguistic framework that raises awareness of the importance of grammatical accuracy and register (p.100). The National Heritage Language Resource Center at UCLA has many useful resources for both teachers and linguists interested in working with heritage language learners. 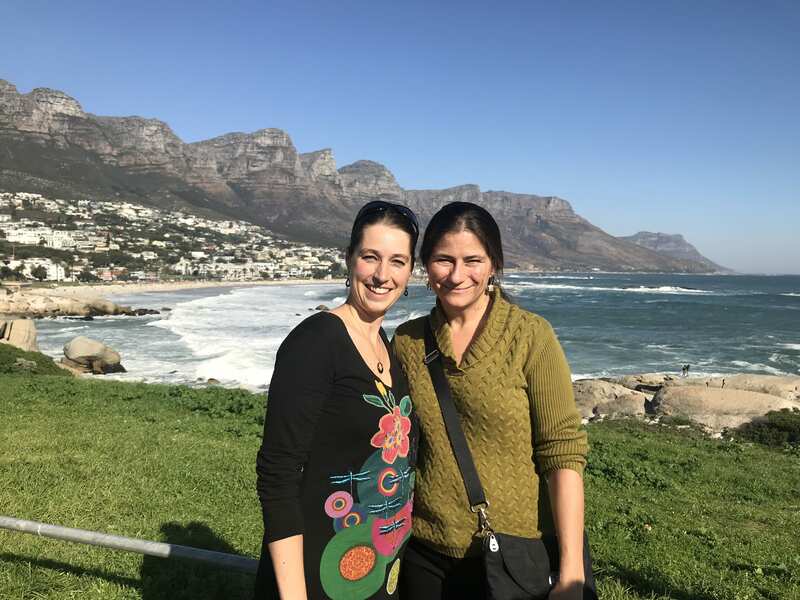 One of the center’s big projects, led by Maria Carreira and Olga Kagan was a national survey of 1732 heritage speakers of 22 different heritage languages across the United States. As a result, the following general profile of an adult heritage language (HL) learner studying the heritage language at the university level was published in 2011. Such a learner (1) acquired English in early childhood, after acquiring the HL; (2) has limited exposure to the HL outside the home; (3) has relatively strong aural and oral skills but limited literacy skills; (4) has positive HL attitudes and experiences; and (5) studies the HL mainly to connect with communities of speakers in the United States and to gain insights into his or her roots. 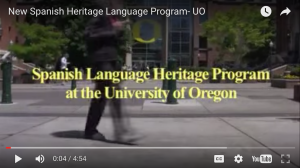 While some universities do have classes devoted specifically to heritage language learners or even whole programs, like the Spanish Heritage Language Program here at the University of Oregon, more often heritage language learners find themselves in the same classroom with foreign language learners of the same language. One of the differences (an assumed advantage) observed for heritage language speakers of various languages over foreign language learners is that the former are exposed to the target language naturalistically from birth in family/community contexts while the latter usually post-puberty and in instructed contexts. From this often assumed definitional difference stem other common observations about heritage speakers being usually stronger in oral skills than in literacy-based reading and writing, having a stronger cultural connection, a larger vocabulary and greater focus on meaning than on form in language use, while second language speakers are believed to have stronger reading and writing skills and metalinguistic knowledge and greater attention to form with noticeably weaker oral fluency. While, unfortunately to date there are not too many empirical studies that test effectiveness of instruction, but those that do find that instruction is useful for both types of learners. Based on these observations, a number of scholars (Beaudrie, Ducar, and Potowski (2014) among others) have called for different or at least differentiated instructional and research methodology approaches targeting the two types of learners. For example, Kagan and Dillon (2009) suggest that macro-based (top-down) and discourse based teaching is more suitable for HL learners in instruction of grammar and vocabulary than the bottom-up grammar/vocabulary to function teaching often used in L2 contexts. 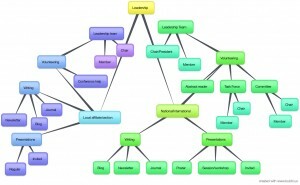 Carreira & Kagan (2011) argue for a community-based curriculum, which incorporates materials and types of activities that help learners connect to their experiences in the U.S.
Beaudrie, S., Ducar, C. & Potowski, K. 2014. Heritage Language Teaching: Research and Practice. Columbus, OH: McGraw-Hill Education. Carreira, Maria. 2011. Formative assessment in HL teaching: Purposes, procedures, and practices. The Heritage Language Journal, 8(1). Carreira, M. & Kagan, O. (2011) The Results of the National Heritage Language Survey: Implications for teaching, curriculum design, and professional development. Foreign Language Annals, Volume 44, No 1. pp. 40-64. Kagan, 0., & Dillon, K. (2004). Heritage speakers’ potential for high-level language proficiency. In H. Byrnes & H. Maxim (Eds. ), Advanced foreign language learning: A challenge to college programs (pp. 99-112). Boston: Heinle/Thomson. Kagan, O., & Dillon, K. (2009). The professional development of teachers of heritage language learners: A matrix. Bridging contexts, making connections, 155-175. The spontaneous gestures people use while speaking have attracted more and more attention from watchful researchers across disciplines in the past decades. What can gestures reveal about the cognitive processes of speakers? How might they aid speakers to communicate and interact with others? Can gestures help us teach and learn? As we teachers know, it’s always a good idea for us to watch ourselves on video (though it’s not always easy!). One benefit is to see how our gestures may be helping or hindering our teaching. 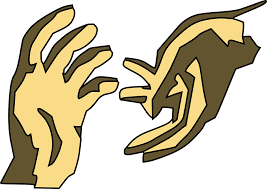 Gestures can facilitate teaching in many ways, such as by illustrating an action or a metaphor, clarifying directions for tasks, or pointing out something in the room. Some gestures can be consciously planned, but many can be simply allowed to emerge naturally. 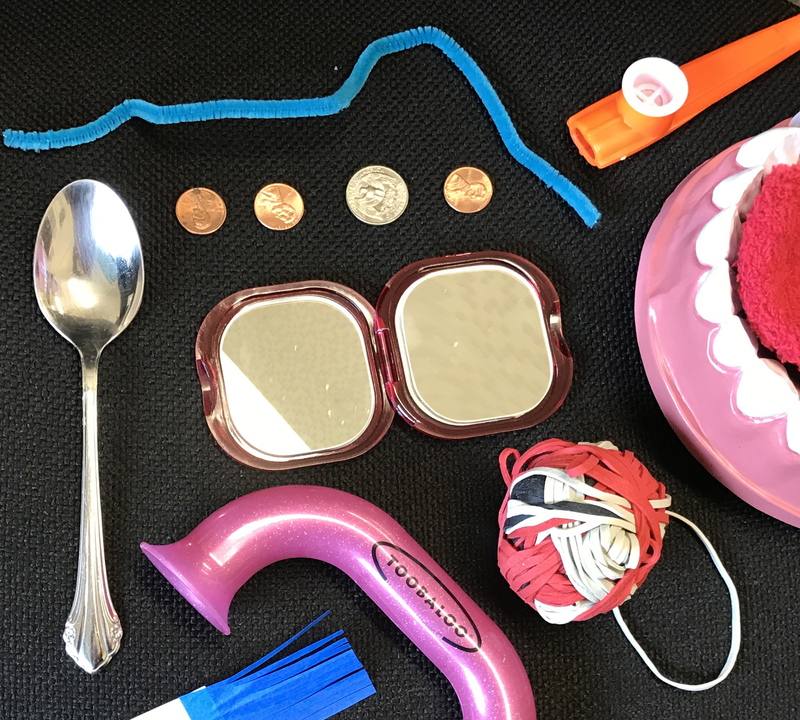 Language learners will be grateful for these visual clues if they are engaging and informative – film yourself and see what you think! As a fun exercise, see if you can guess what Javid is saying during these short GIFs from a recent, unrehearsed microteaching session he co-taught with classmate Juli here at UO a few weeks ago. Match the lines of transcript with the GIFs (they are not in the right order now). Click on each GIF to see it in action. Answers are given at the bottom of the post.